It was a sea of Blue with crowds of people filling out Subrail park today as the Fiji Day Celebrations unfolded in Labasa today for the first time. Following a march from Y Corner in Labasa town to Subrail park the Fiji Military had conducted a 21 gun salute. Fijivillage also took some time to speak to people in Labasa who were part of the Fiji Day Celebrations today. Tonight there will also be a Military Tattoo held at Subrail park to culminate the Fiji Day celebrations in Labasa. While officiating at the Fiji Day March in Labasa Town, Permanent Secretary of the Ministry of Defence Osea Cawaru stated that Fiji has come a long way since independence and this year we celebrate our 48th year as a sovereign nation and this is a remarkable achievement and should be celebrated extensively by all. Cawaru also stressed that this Fiji Day celebrations is is a historic milestone because government has chosen to stage the main Fiji Day event in the friendly Northern Town of Labasa. Also present at the Fiji day celebrations in Labasa was the President Jioji Konrote, Prime Minister Voreqe Bainimarama, Commander of the RFMF Viliame Naupoto, members of parliament and senior government officials. 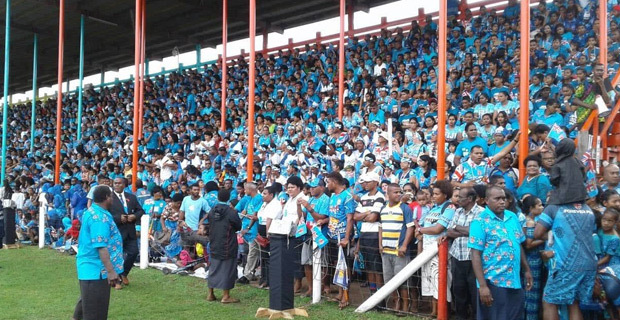 Fiji celebrations in were also held in other divisions in Navua for the Central Division, Lautoka for the Western Division and Levuka for the Eastern Division.